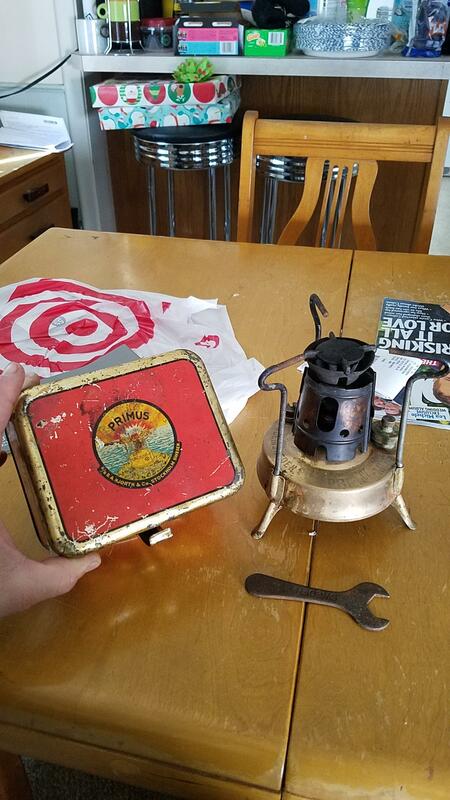 My granddaughters father found this Primus #96 in a house he was working on and gave it to me. It looks to be all there. I read a quick little online and believe it is a kero burner. What good info do you guys have on it? hikerduane should be able to tell you all about it. Nice find. It look very similar to my Canadian Coleman Solus. It is indeed a kero burner, Took me a bit of a learning cure to get going. Duane has a million of them I think. It only burns kero. Fill tank 3/4 full. Screw down filler cap. Loosen the air valve in filler cap. Fill the cup with alcohol (I used yellow bottle HEET), when the alcohol burns down, screw down the air valve, pump it a couple of times and it should light. Regulate flame but lowering the air pressure with the valve or raising it with the pump.. Much more forgiving then white gas. Usual problem is bad filler cap seal so it won’t hold pressure. There should be a couple of letters stamped on the bottom which are a code date. Google will supply the matrix. Fun stove, I love them. They, like all stoves will breed like an amoeba, before you know it, 2, then 4, then 104. The trouble with tribbles! Bet it takes right off. My Kero burners like that (wish I had a 96) are easy starters. Duane will be by soon. Great stoves. Kero burning and not a positive shutoff so you’ll have to preheat with alcohol and then build pressure when alcohol is almost burned out of preheat cup. NRV in the pump tube might need serviced if the spring is weak or rubber pip is hard and will require a NRV tool to remove that valve. I have a couple and like them. You’ll hopefully also like it but if you decide to sell or trade, keep me in mind as I’m always game for another Primus project 😃. hikerduane is our brassie guru around here, and like other have said he'll be along shortly. That's a real nice find. The box look great and those aren't that common. Only things missing are a pricker tool for cleaning the 'jet' and a meths tin. Its jetted for kero. Use the little screw on top the filler cap to regulate the pressure down for a simmer if desired or for full shut off. 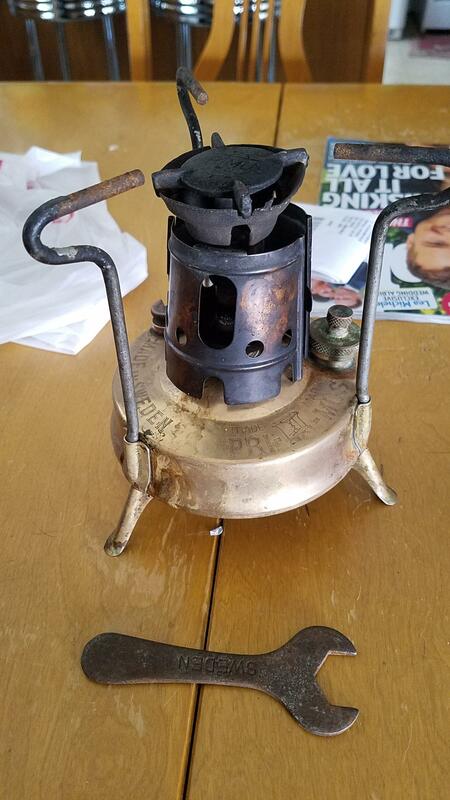 Most parts can be found thru ebay or clasic camp stoves. Looks good, can't add anything, other experts here, I just have a bunch. Should be a one or two letter date code in a circle on the fount bottom. Most issues with these are hardened cap washer, NRV needs a pip (Primus has the most issues and can be most difficult to remove), orifice on lipstick too large and needs peening. Older ones may have the burner(lipstick) carboned up some. Prime good, closing air release before prime fuel burns off, but not too soon, slowly add pressure once started, minute maybe. 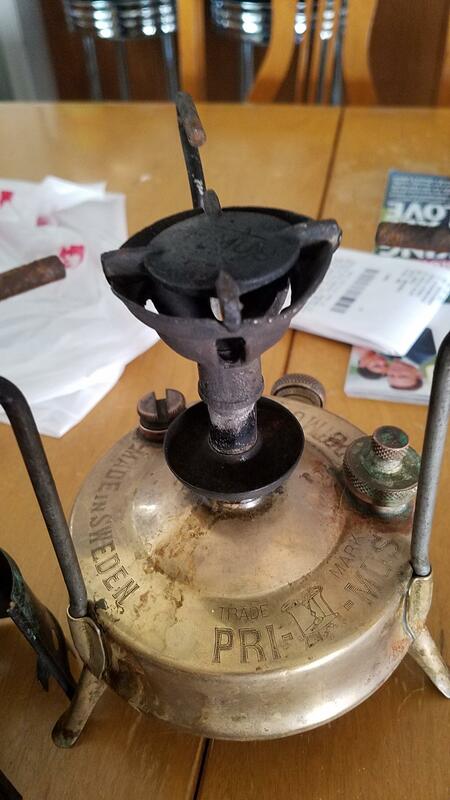 If issues with it spitting raw fuel, check brass mesh in burner, clean in vinegar then wire brush clean, check for carbon in burner and fit of bell on the lipstick, should not be very loose it at all, you need thermal feedback so fuel vaporizes. If it burns too yellow, orifice on burner is too large. Thanks guys for the info. I'm going to get it cleaned up and see what happens!